Hope you all had a lovely Valentine's Day weekend! My boyfriend took me to White Scar Cave near Ingleton, North Yorkshire (England). For anyone who enjoys going underground with a hard hat and has an interest in cave formations/caverns I'd recommend! I'd also suggest suitable footwear. Unaware of my underground activities, I was not equipped with such a necessity and spent the tour tip-toeing in heeled boots to avoid the peril of metal walkway grating. Hmmm. Working with leather cord and fabric knots allow me to create more sculptured shapes. I will definitely be developing this technique further. I've been testing out a sample for the past week and I'm a little in love. 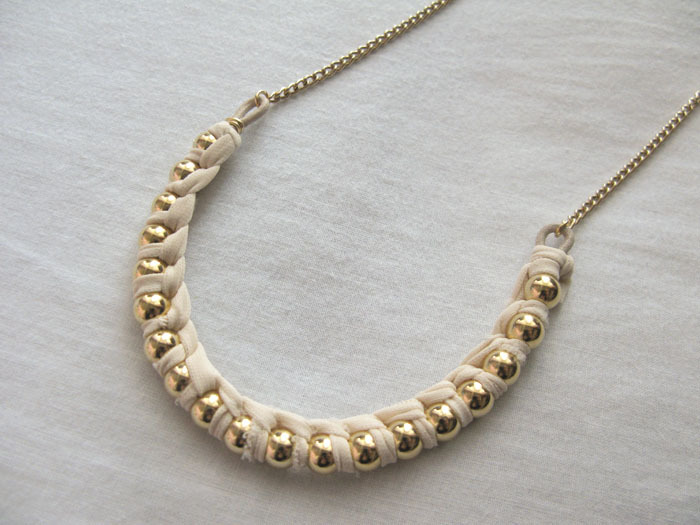 A remade version of the twisted metal necklace, this time with narrower mesh. I'll be replacing the grosgrain ribbon with thick black silk and then it's ready to list in the shop. I finally got a chance to perfect the mesh bracelet last week and my hands are still healing from the perils of working with metal. 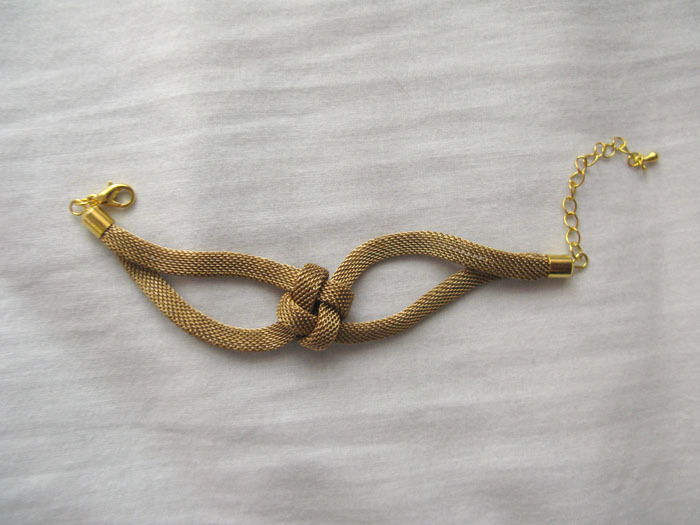 I've already had a number of requests for the mesh bracelet since I posted the updated version to my tumblr. I'll be making a batch of them this week! oh, I almost forgot!! 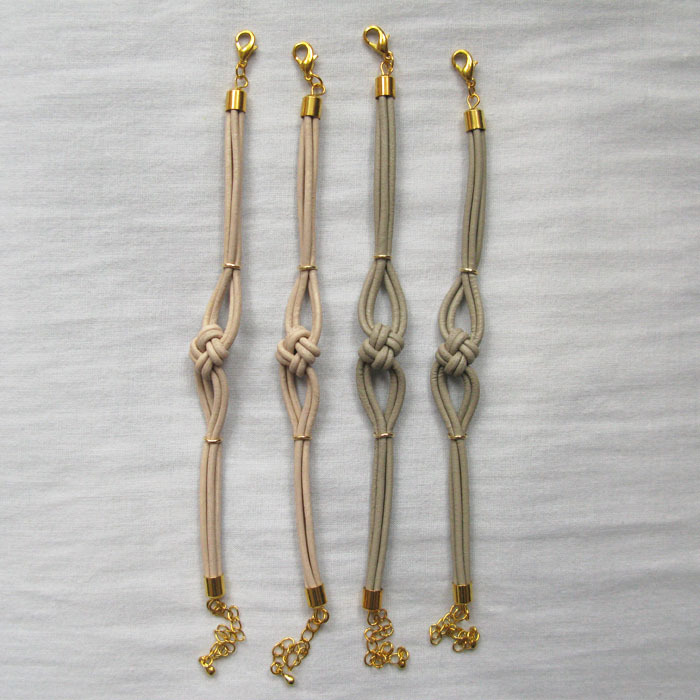 I'm giving away one of my sailor's knot bracelets over at Post Grad Haircut. All you have to do is leave a comment with your email address. Easy. The giveaway ends tonight at midnight so be quick!! 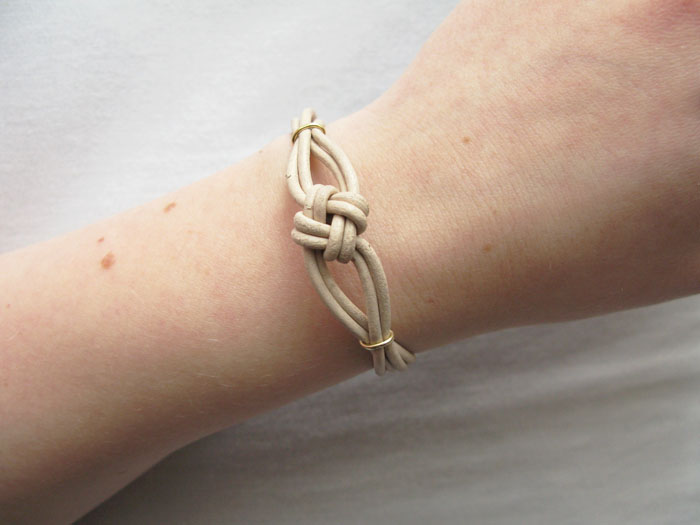 Do you have instructions on how to make the sailor knot bracelet? What I noticed are those fabulous brass beads! Those trendy pieces inspired me to give my daughter a jewelry gift for her eighteenth birthday. She loves brass beads so much. She even asked a local jewelry designer to design her one. This is just a thought. Since jewelry designers are getting high demands on their products, I think it is best to have good relationships with their <a href="http://rotaxmetals.net/brass-rods-manufacturers.htm" rel="nofollow">brass manufacturers</a> and <a href="http://rotaxmetals.net/brass-rods-manufacturers.htm" rel="nofollow">brass rod suppliers</a> for them to get quality brass, copper and wire supplies. I believe that she even ordered some pieces for her blog giveaways. 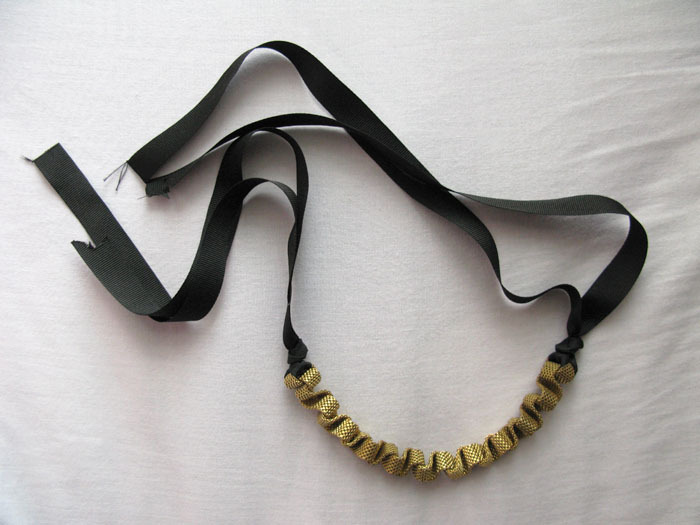 The brass bead necklace is fantastic, a clever idea and such a great outcome. Hope to see more variations on it. es todo precioso,delicado, sacado de un sueño, no se con cual quedarme...enhorabuen por tu trabajo. WOW!! I really love your pieces! So simple but great statements, truly beautiful! I hope you had a nice day and enjoy your weekend! 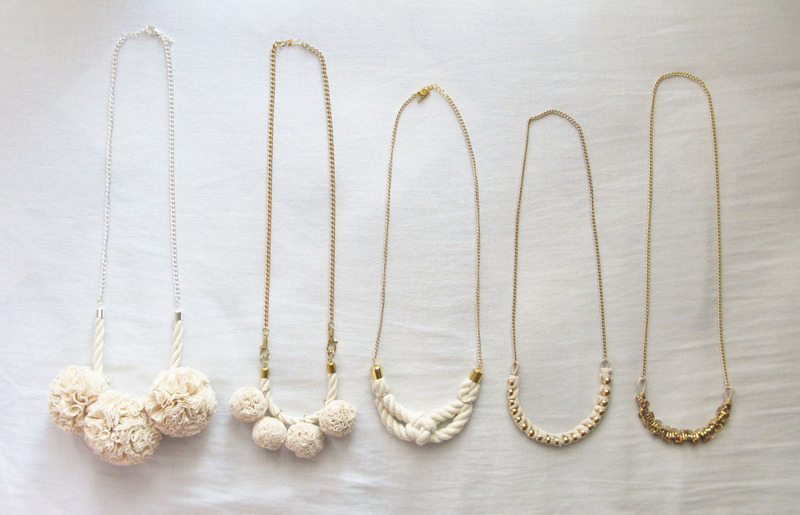 i like the necklaces so much!! i cannot wait until you list these in the shop!! esp. the mini pom poms and leather bracelets! thank you everyone :)<br /><br />Sarah: I'm currently working on my first wedding order! such a lovely feeling creating something for such a special day..
Amazing! Beautiful. I am in love.<br />Hugs from Brazil! these are brilliant! my fave is the first pic/showcase--what a beautiful collection of creations!<br />j. What lovely creations! I love the pompom necklaces and the leather bracelets!! Hi there! I'm so inspired by your work! I was wondering if you could recommend a high quality online jewelry supply store for us beginners to get started ?<br /><br />I would really appreciate your feedback. Thanks so much! Beautiful!! I love the rope necklace!